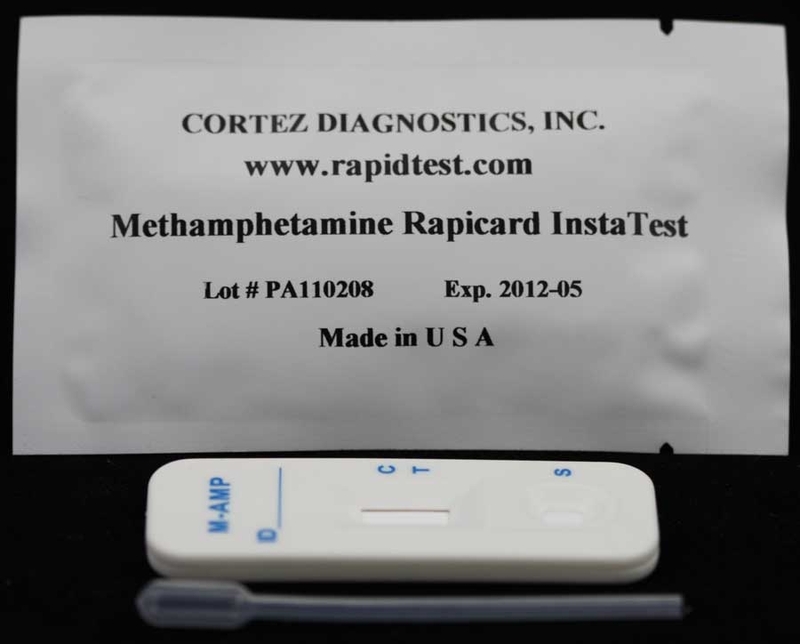 Los Angeles based Diagnostic Automation/Cortez Diagnostics, Inc., your source for drug testing supplies, offers a 5 panel Drug and Alcohol Test for any combination of Amphetamin (AMP), Barbiturate (BAR), Benzodiazepine (BZD), Buprenorphine (BUP),Â Cannabinoid (THC), Cocaine (COC), Ecstasy (MDMA), Fentanyl (FTYL), Ketamine, Methadone (MTD), Methamphetamine (MET), Methylphenidate (MPD), Opiate (OPI) (MOR), Opiate II (OPI) (MOR) (HER), Oxycodone (Oxy), Phencyclidine (PCP), Propoxyphene (PRP), Tramadol, Tricyclic antidepressant (TCA), and alcohol.Â This 5 panel drug testing kit features drug test strips and is designed for qualitative determination of drug substances in human urine specimen. 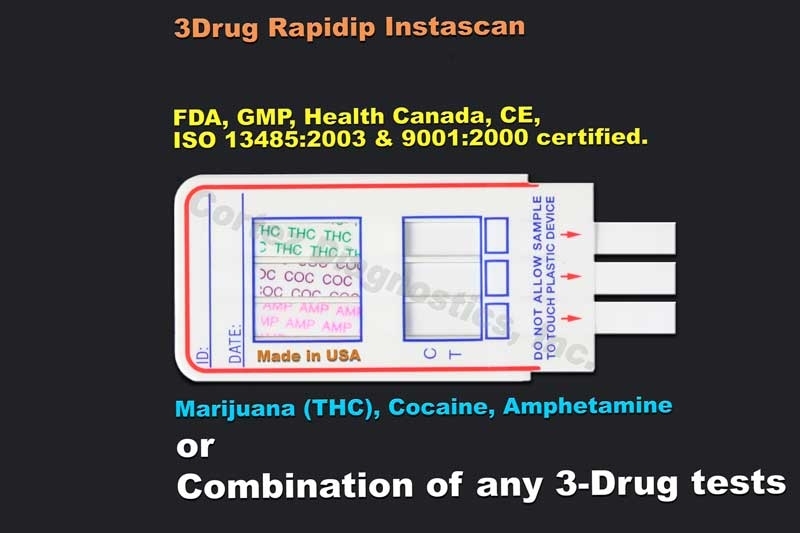 The five panel Drug and Alcohol Testing device is based on the principle of specific immunochemical reaction between antibodies and antigens to analyze particular compounds in human urine specimen. The assay relies on the competition for binding antibody between drug conjugate and free drug which may be present in the urine specimen being tested.Â When any combination of drug or alcohol is present in the urine specimen, it competes with drug conjugate for the limited amount of antibody-dye conjugate. When the amount of the drug or alcohol is equal or more than the cut-off, it will prevent the binding of drug conjugate to the antibody. Therefore, a positive urine specimen on the 5 panel drug and alcohol test will not show a colored band on the test line zone, indicating a positive result, while the presence of a colored band indicates a negative result.Â An internal control line is present in the test window to work as procedural control. This colored band should always appear on the control line zone if the 5 panel drug and alcohol drug testing device is stored in good condition and the 5 panel drug and alcohol drug test is performed appropriately. Acute alcohol intoxication can lead to loss of alertness, coma, and even death. Long term effects include internal organ damage and birth defects. The blood alcohol concentration (BAC) at which a person becomes impaired is variable. The United States Department of Transportation (DOT) has established a BAC of 0.02% (0.02g/dL) as the cut-off level at which an individual is considered positive for the presence of alcohol. Since urine alcohol concentration is normally higher than that in saliva and blood, the cutoff concentration for alcohol in urine is set at 0.04%.Â The One Step Urine Alcohol RapiDip Insta Test is based on the high specificity of alcohol oxidase (ALOx) for ethyl alcohol in the presence of peroxidase and enzyme substrate such as tetramethylbenzidine (TMB). The distinct color on reactive pad could be observed in less than 1 minute after the tip was contacted with urine samples with the ethyl alcohol concentration greater than 0.04%. It should be pointed out that other alcohols such as methyl, propanyl and allyl alcohol would develop the similar color on the reactive pad. However, these alcohols are not normally present in urine. 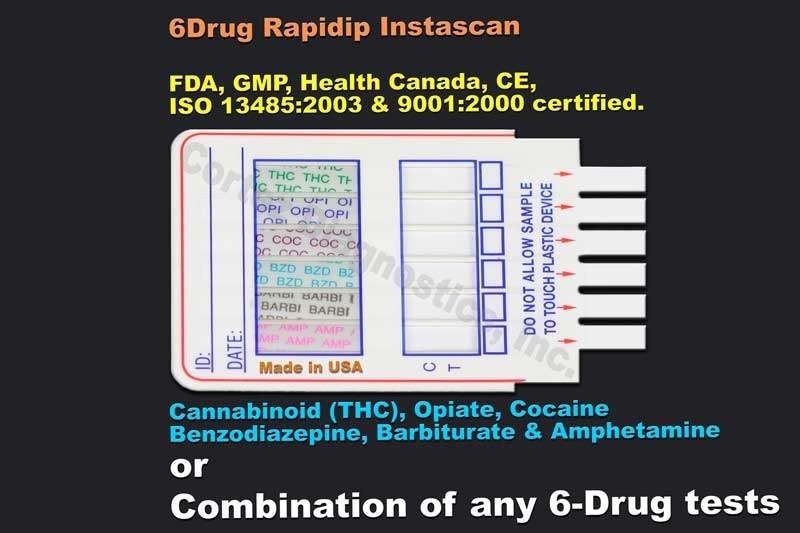 The five panel drug and alcohol test kit provides only a preliminary analytical test result. A more specific alternative chemical method must be used in order to obtain a confirmed analytical result.Â Gas chromatography/ mass spectrometry (GC/MS) has been established as the preferred confirmatory method by the Substance Abuse Mental Health Services Administration (SAMHSA). Clinical consideration and professional judgment should be applied to any drug of abuse test result, particularly when preliminary positive results are indicated. 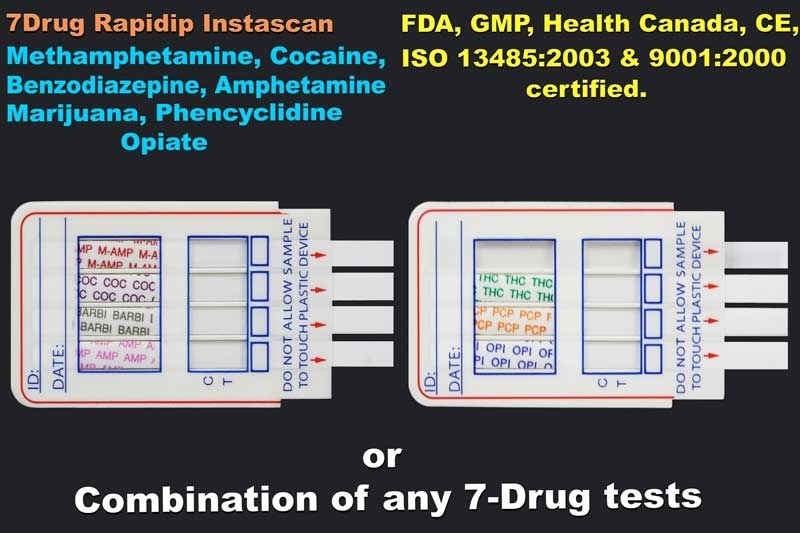 The optional built-in Adulteration Test is for validation of urine specimenâ€™s integrity and must not be used for In Vitro diagnostic use.Â The cutoff level for this 5 panel Drug and Alcohol Test is 0.04%Â For customized cutoff level 5 panel drug and alcohol drug tests, please contact Customer Service.Â This 5 panel drug and alcohol test is also available in cassette or strip format.